Fast Eddy Racing are pleased to announce that the entry for the first round of the 2019 ACU Eddy's X-treme Championship are now open. 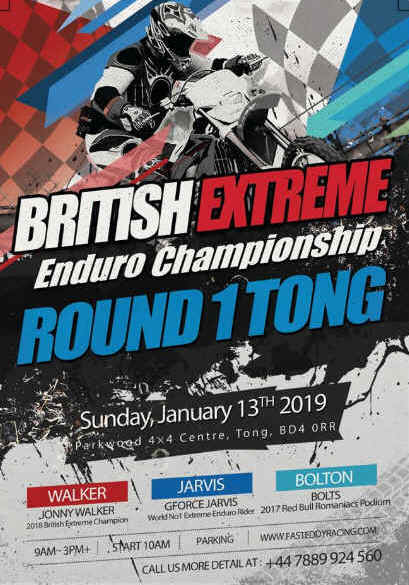 This will be the first of the planned 6 round series for 2019 and will begin, as in previous years, at the very popular Parkwood 4x4 Centre, Tong, BD4 0RR on January 13th. This popular venue has seen some nail-biting racing on a course that challenged riders of all abilities over the last few years, but the Fast Eddy track build team have already been looking at some new sections to include at this event to give both riders and spectators that little something extra for 2019. The event will follow the same format as in 2018 with a two-hour morning event for Sportsman, Sportsman Vets and Youth and a two-and-a-half-hour afternoon event for Clubman, Elite Vets, Experts and Championship. As in 2018 the AM event will go one way round the track and the PM event will ride the track in reverse, with a few "tweaks". Entries are available by sending the form and payment to Fast Eddy Racing, Unit 2, Rolling Mill Road, Norton Canes, Staffs, WS11 9UH, email fasteddyracing@hotmail.com , call Chris on 07889924560 or 01543 450150 (option 2) or PM her on Facebook. The closing date for all entries will be the 5th January 2019 and all entries must be paid for in advance.